Raccoons are very common in Orlando, mainly because they have adapted so well to living in urban areas. As excellent climbers, they use their strength and nimble hands to tear into areas in search of food and shelter. While raccoons like to den in trees, they also love to den in attics; especially mothers who are getting ready to birth their young. 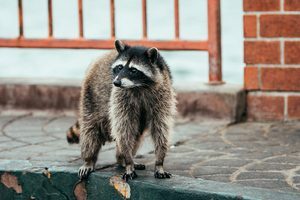 While raccoons are not dangerous creatures, it’s necessary to remove them from your property to avoid paying a significant amount for repairs. The most humane way to remove a raccoon from your property is by using a live trap. Follow these helpful step-by-step instructions to ensure trapping success. Put bait in the trap – Place a sweet food inside the trap where a raccoon has to fully enter in order to reach it. For 1-Door traps, place the bait all the way at the end and for 2-Door traps, put the bait in the center. Because raccoons can knock over traps to get the food, you should place a heavy object on top of the cage such as a weight or brick to keep it secured. Set the trap – Follow the trap’s instructions on how to carefully set the doors to the open position. Regularly check the trap – You never want to leave an animal trapped for an extended period of time, so it’s important to continually check the trap, at least every 24 hours. After catching a raccoon – Once you catch a raccoon, you must follow your state’s legal guidelines on how you can relocate the animal. Live traps are used to successfully remove nuisance wildlife from your property, but they have to be the correct type of trap used in the right way. If you have found a raccoon living in your attic, it could be a female raccoon, which means you must make sure to locate any potential baby raccoon pups that could also be living in the attic as well. If you have tried to remove raccoons from your property and were unsuccessful, or would like to hire a professional with years of experience trapping and excluding wildlife, call Critter Control® of Orlando. We have been performing raccoon removal for over 20 years and even guarantee our work for 3 years. To schedule your free home inspection, call 407-295-7194.